Learn about the recommended initial company settings that will help you get started with your Costlocker processes in no time. Set up your basic company settings by clicking your name in the upper right corner of the screen, then click the Settings button. Continue by clicking the Company Settings tab. There can only be a single Owner of the account. The Transfer Ownership button will transfer this role to a different person registered in your Costlocker account. 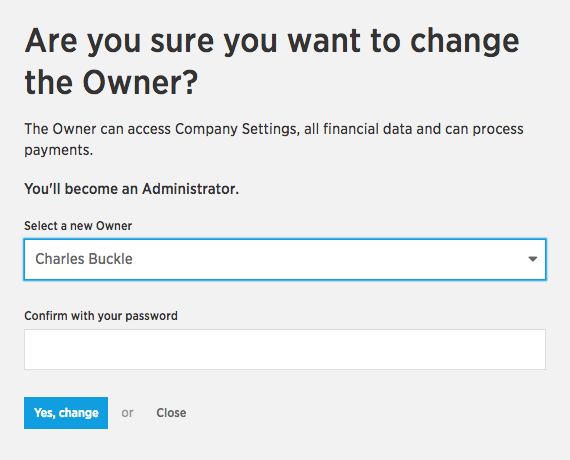 Clicking the Transfer Ownership button will take you to a screen where you’ll need to enter the new Owner and your password. After a successful ownership transfer, you’ll become an Admin. Learn more about this in a separate article.